Which Is Better: Treadmill or Recumbent Bike? You want to make your workout efforts pay off. With the array of fitness equipment offered in gyms, it can be difficult to figure out which machine will offer the best workout for your needs. Two effective pieces of equipment, the treadmill and the recumbent bike, will help you burn calories and build cardiovascular fitness. Determining which is better really depends on your personal needs and exercise goals. Treadmills allow you to take your walk or run indoors when outdoor conditions or schedules preclude an outdoor workout. Commercial treadmills may reach speeds of 10 to 15 mph, depending on the model. Most offer an adjustable ramp that helps you simulate hill climbing. Most standard treadmills range from a 1 percent grade to 10 to 15 percent grade, while super incline trainers may reach a 30 percent grade. Most fitness levels can use a treadmill and the movement comes naturally. 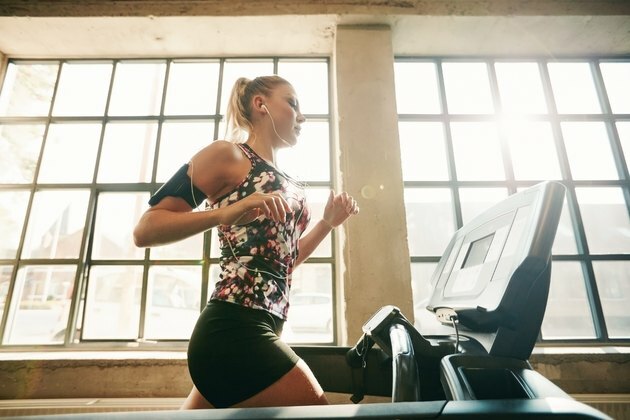 Treadmills offer a lot of variety in your workout -- you can walk casually, hike hills, perform intervals, train for a race, run sprints or take a light jog. Recumbent bikes look like a regular stationary bicycle, but with a bucket seat and pedals in front of the body, rather than below the hips. The handlebars extend naturally in front of the shoulders, allowing you to hold on without putting stress on the wrists or shoulders. A recumbent bike helps people who cannot incur impact, who are recovering from an injury or have problems with their balance achieve a cardiovascular workout. To adjust the workout, you hit a button on the console that changes the resistance -- or difficulty -- of the pedal-push force needed. If you suffer from joint problems or back pain, a treadmill may aggravate your condition. A recumbent bike better accommodates people who are 50 pounds or more overweight, notes the Cleveland Clinic, as it does not require constant impact on your joints. Those who are extremely fit may find that a recumbent cycle does not offer enough intensity for their needs. Working out on the treadmill can burn more calories than a similar effort on the recumbent bike. In 30 minutes, a moderate workout on the stationary recumbent bike burns about 260 calories for a 155-pound person. In the same amount of time, a moderate jog of 5 mph burns 298 calories. Going faster or adding an incline burns even more. If you walk at 4 mph, however, you will only burn 167 calories in a half hour. If weight loss and calorie burn motivate your fitness, consider how hard you are able to exercise on the treadmill before choosing it over the bike. If you hate running on the treadmill, then it is clearly not a better choice. You may stick with it for a few weeks or months, but you may begin to find ways to avoid exercise altogether, which will not help with weight loss or physical fitness. The recumbent bike may become monotonous, but it is easier to read or watch TV while using it. ACE Fitness: ACE Fitness: What’s the Best Piece of Cardio Equipment to Use?